I'm in a cluster of Internet radio podcasts this week. Cameron Reilly hosts "G'Day World," a Melbourne-based podcast covering science, technology, politics and media. G'Day World was Australia's first podcast, and has been active since 2004. 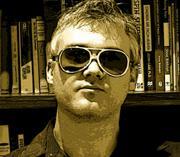 Cameron invited me to chat for a bit as part of the lead-in to September's Singularity Summit. It's one of those conversations where I thought I stumbled, but Cameron seemed happy with it. In any case, it's not my best podcast example, but it does bring up some interesting topics. R.U. Sirius invited me back to serve as co-host for his shows this last weekend, and two have now appeared as MP3s. The first is an extended conversation with Steve Wozniak on Neofiles, primarily about the various large and small pranks he's pulled on friends and strangers over the years. Some are pretty amusing, but I suspect that most work better in the moment. I was a bit disappointed to discover, in a post-show conversation, that he's a bit of a climate-change denialist, but I suppose he could have been pranking me at the time. The second, on the RU Sirius Show, covers a mix of topics, starting out talking about the cybermoth story (with Woz sticking around), then a long conversation with David Talbot about his new book on John and Robert Kennedy. Although Talbot's book is a broad examination of the Kennedy legacy, most of the discussion focused on the evidence for a conspiracy around the JFK assassination. I'm more active in the cybermoth story than in the Talbot part, fwiw. We recorded a third show after Talbot left, me talking about augmentation and cyborgization; I don't know yet when that will be up. After months of work, the Metaverse Roadmap Overview is now available for download; get it here as a PDF. Written by Jerry Paffendorf, John Smart and me, the Overview is the end-result of the first Metaverse Roadmap project meeting, in May of 2006. It's not simply a summary of the meeting, however -- rather, it's the first attempt to synthesize current and emerging social, economic and technological trends around virtual worlds, immersive networks, and ubiquitous information. Our scenarios will be influenced by all of the broader concerns facing the planet. Ethnic strife, political instability and war, energy, water, and other resource issues, trade, globalization, economic growth and poverty, environmental degradation and sustainability initiatives, migration, scientific and engineering advances, education and the media, ancient drives for intimacy, individuation, and spirituality, our emerging digital and participatory culture, unknown surprises and catastrophes, all of these and more will shape the technology development and adoption choices in tomorrow’s Metaverse. Most importantly for each of us, at this pivotal moment in human history, there are unique opportunities for enlightened corporate, political, and social leadership in Metaverse exploration and development. We propose that the best use of the Metaverse Scenarios and Inputs in this inaugural roadmap is not simply to consider them for near-term economic potential, but to ask how these technologies might help or hinder our ability to manage humanity’s larger concerns, both now and in the future. How might we use the various forms of the Metaverse to guide our response to global warming, and the emergence of “climate neutral” energy and transportation? How might we use these systems to avert a war, improve an election, reduce crime and poverty, or put an end to human rights abuses? How might we use the Metaverse, in the words of Jonas Salk, to become "good ancestors" to our descendants? But that doesn't mean that it's all hand-waving, big picture meta-theory: there's abundant, detailed consideration of new technological forms and their implications. Various sections examine Relationships and Identity, Information and Education, Transparency and Political Power, Information Shadows, Leadership and Competition, Reputation, Privacy and Control, Integration and Acceptance, and Technological Viability. While detailed and dense, it's also a fairly fun read. The document is heavily-illustrated, with images showing both present-day implementation of these Metaverse tools, and conceptual models of future systems.. I have to say that this document ended up being better than I had expected by late in the creative process. It's rare that multiple authors editing and re-editing each other can come up with something that is neither too bland or too inconsistent. At the same time, this is clearly a first pass, an initial attempt to bring together disparate technological trends and think about the way they intersect. The goal of the Metaverse Roadmap Overview isn't to predict, but to provoke, and I believe it does so well. I would, of course, greatly appreciate any feedback you wish to offer, either here or added to the Metaverse Roadmap wiki. 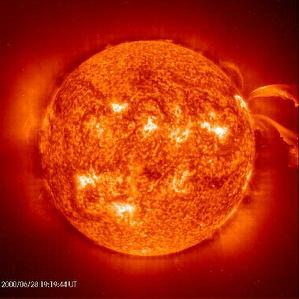 Summer Solstice: the longest day of the year!  Imagine This: "Imagining the Internet" is a part of the Pew Internet Project, run out of Elon University in North Carolina. For the past several years, they've been asking experts and citizens alike to imagine the future evolution of the Internet. In May of 2006, the Project hit the Metaverse Roadmap event, and videotaped a couple dozen attendees waxing philosophical about the net's future. These video conversations, along with transcripts, are now available online. The interviews were done in a room away from the main session, and couldn't readily be overheard by other attendees. With that in mind, take note of how many people give essentially the same answer for the first question.  Sticky Nano-Fingers: Geckos are able to perform amazing feats of adhesion due to the presence of nano-scale hairs and tips known as stetae and spatulae respectively. Geckos can hold onto glass, but their adhesion leaves no residue, can easily be lifted when desired, and actually get cleaner in use. Figuring out how to make nanomaterials with properties approaching the capabilities of Gecko feet would be both useful and important. So how about something better than Gecko feet? Rensselaer Polytechnic Institute researchers have developed artificial Gecko adhesive tape that's actually stronger than the real thing. For the first time, the team has developed a prototype flexible patch that can stick and unstick repeatedly with properties better than the natural gecko foot. They fashioned their material into an adhesive tape that can be used on a wide variety of surfaces, including Teflon. [...] The material could have a number of applications, including feet for wall-climbing robots; a dry, reversible adhesive in electronic devices; and outer space, where most adhesives don’t work because of the vacuum. One of the unmentioned possibilities is the use of Geckomimetic tape as a medical adhesive: able to tightly close wounds, but removable without leaving any residue or pulling up hairs. This stuff could do away with sutures entirely.  CyberMothra: A Times of London article about robotics researchers implanting a control chip inside a moth pupa and controlling the adult form has gotten a bit of blog play, and for good reason: who can resist talking about cyborg moths, especially when they're being made for the military to use as surreptitious observers? The article is actually somewhat ambiguous about whether the project has been completed, is underway, or is simply being contemplated. It's worth noting that there's nothing at Rodney Brooks' site at MIT about the cyber-moth project; DARPA, the funding agency, is similarly -- and unsurprisingly -- mum on the subject, as well. Whether cyber-moths currently exist or not is beside the point -- they're certainly within the realm of near-term possibility. And they raise all sorts of uncomfortable questions. Just how complex can the control get? How long until the same kind of technology is available for mammals, even humans? What does this do to the health of the cybernetic creature? Is this the real future of cyborgism? My colleague at the Institute for the Future, Jessica Margolin, made this further observation: this is the kind of technology that demands that we get full Constitutional protections back in order, Guantanamo closed down, and a recognition of the inherent limits of government agencies to spy upon citizens. Just like decades of training practices have made US military officers allergic to the very idea of launching a military coup, we need to institute deep training of all intelligence and law enforcement personnel that makes them reluctant to the point of horror to engage in violations of citizen rights.  The Answering Machine Footprint: Consider this possible, but as yet unverified. According to the Green LA Girl, The Green Book claims that eliminating the answering machine nationwide, and relying on phone company voice mail, would reduce the national carbon footprint an amount equivalent to removing 250,000 cars from the road. As I note in the comments there, given what I learned about cheeseburgers, I wouldn't be shocked if this was true -- but I also know just how easily these kinds of estimates can go horribly awry. The latest issue of Technology Review contains a lengthy, very well-researched story on the Metaverse, written by Wade Roush. Wade interviewed me for the piece, and I have a couple of reasonably accurate quotes included therein; he also pulls from the will-be-published-any-second-now-I-promise Metaverse Roadmap report. It's a long article, but highly recommended -- he really does a good job of making the whole concept make sense. The initial link to me in the web version of the article goes to a brief bio at Wikipedia. Now, I was aware of the Wikipedia entry, but tried not to pay much attention to it. Now that a real journal is linking to it, however, I kind of think it needs to be cleaned up. It has all the signs of too many disconnected edits; weird grammar, awkward phrasing, and an odd balance of content. Thing is, it's not a good practice for the subject of a Wikipedia entry to go in and monkey with it, even in the name of fixing bad grammar. Any of you out there who have decent Wikipedia juju want to go in and take a crack at it? 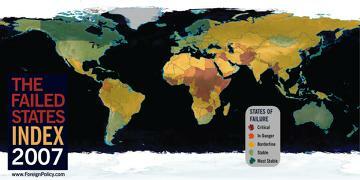 Foreign Policy magazine has come out with its annual listing of "Failed States. Perhaps not surprisingly, most of the media attention to this list has focused on Iraq being #2 on the list, behind Sudan. Of greater interest to me, however, are two of the subsidiary pages: the methodology of the analysis of failure, and a chart showing a relationship between failed environments and failed statehood. Foreign Policy's graph mapping the correlation between sustainability and stability shows clearly that the two are positively connected: failed states are almost invariably environmental disasters, and stable states are in nearly every case reasonably sustainable. On the surface, this is entirely unsurprising; people living in fear for their lives are not apt to be good stewards of the environment. But two unanswered questions leap to mind that could dramatically change the analysis: the definition of sustainability (I couldn't find a reference for FP's sustainability ratings updated*); and the direction of causation. FP's brief definition of sustainability is "a country’s ability to avoid environmental disaster and deterioration." That, of course, sounds more like "resilience" to me, and says nothing about a country's ability to maintain functioning ecosystems, clean water, and the like. It's very likely that the environmental resilience of a state will closely match the political and social resilience. But even states that manage to get their political acts together could be unable to survive if key ecological systems and resources are lost or insufficient. An even bigger question is the direction of causation. To what degree is the environmental degradation or collapse in these states the result of the failure of governance, and to what degree is the environmental degradation or collapse a contributor to the failure of governance? Both can be true, of course, but is there a clear trend or pattern? This is an important question, because if environmental degradation tends to precede state collapse (not as the sole factor in the collapse, but as an important political "forcing"), the acceleration of global warming-related ecosystem disruptions will mean more than economic loss and climate refugees. Given the potential importance of this factor, it's odd that while it appears in the Foreign Policy discussion, it's not an element in the analysis. Security analysts have been trying to assemble a workable quantitative assessment of geopolitical stability for decades. Most have had readily-identifiable flaws (for example, the RAND Strategy Assessment System, built by the RAND Corporation in the 1980s and early 1990s, used a model of US-Soviet friction that had, as its least threatening level, a conflict equivalent to the Cuban Missile Crisis). CAST is no exception -- one clearly missing element is the degree to which neighboring states add pressure for failure, whether due to their own failure or as a means of undermining geopolitical opponents. As with the environment, Foreign Policy recognizes the importance of this factor in its own discussion, but it really should go into the core analysis. Failed states are the end-point of "system disruption" warfare. We need to get a lot better at understanding all of the operational factors if we're going to have any chance of figuring out a way to respond effectively. And in this struggle, global guerillas and global warming operate hand in hand. * UPDATE: Carolyn O'Hara from Foreign Policy wrote to tell me that the environmental ratings were based on "environmental sustainability scores provided by the 2005 Environmental Sustainability Index produced by Yale and Columbia." Thank you, Carolyn. Failure happens. Strategic plans that don't take into account the possibility of failure -- and propose pathways to adaptation or recovery -- are at best irresponsible, at worst immoral. The war in Iraq offers an obvious example, but the potential for failure in our attempts to confront global warming* may prove to be an even greater crisis. This is why I'm so adamant about the need to study the potential for geoengineering: we need to have a backup plan. And if that fails to head off global disaster, or (if done without sufficient study and preparation) exacerbates problems further, we need a last-ditch plan for recovery. What does it mean to prepare for recovery? I've described it before: a civilization backup, holding a full record of who we are as a civilization, built in a way to facilitate recovery after a global disaster. This is something of an ambitious plan, however, and is not likely to even be considered for decades. In the meantime, a smaller-scale project would be entirely feasible -- and it turns out that such a smaller-scale backup appears to now be underway: the Book & Seed Vault. So we pose this question: Are we as a civilization to be knocked back to a hunter-gather stage, or is there a way we can leave a legacy that provides for the future of mankind? 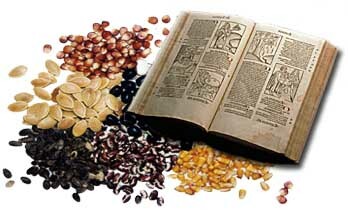 [...] The Book and Seed Vault, Inc. has been formed for this purpose— gather and safely maintain long term storage of our civilization’s knowledge, plant seeds and medicinal seeds. Much like the seed storage facility in Norway, the Book & Seed Vault would maintain supplies of seeds for key edible and medicinal plants; unlike the Norwegian effort, the Vault would also include an assortment of books, mixing academic, instructional (including a full selection of MAKE magazine, I hope! ), and cultural. Long-term plans include underground concrete bunkers dotting the continent, but for now, the initial vault will be in rural Oregon. It's clear that the Book & Seed Vault is a very new organization, with great ambitions but limited resources. They just started up in the last few months, and their expertise seems a bit uneven -- lots of detailed info about preserving books, but more general plans for handling the seeds. I suspect that they'll drop the plans to archive CDs and DVDs in short order, when they look at the infrastructure involved for handling electronic media. In fact, the Book & Seed Vault may prove to function better as a model and instructions than as an actual vault. We'd need more than one site for any kind of disaster recovery system to be truly useful; we have to assume that many of the eventual locations will be unavailable, so the more the better. The right scale for something like this is probably the "community" -- a bit bigger than your neighborhood, but smaller than a city. Think of it as open-source disaster prep -- a site and set of resources offering detailed instructions (which can be updated by the users, of course) showing you how to build a recovery vault for your community. What are the physical specs for the facility? Which seeds are appropriate for your regional climate? What are the key instruction manuals and guidebooks to include? How best to store and protect the vault's contents? I could see this done as a wiki and mailing list, probably with some YouTube videos demonstrating various techniques for proper seed and book storage. This kind of idea isn't simply updated survivalism, it's part of a larger effort to develop greater social resilience. Now there's a sequel to Mad Max I'd go see: a post-disaster society run by farmers and librarians! For those of you who (a) just can't get enough of the "cheeseburger footprint" story, (b) are curious about what my voice sounds like, or (c) have two minutes to kill, my "KQED Perspectives" piece on the cheeseburger carbon footprint played on the radio this morning, and is now available in digital media form. Enjoy. My colleague at the Institute for the Future, David Pescovitz, stuck my face on BoingBoing in the link to the Accidental Cyborg article (yikes! ), but told me about this terrific sticker made for Gareth Branwyn's hip replacement. Let me tell you, being a cyborg isn't all it's cracked up to be. But it might be, sooner than you expect. The popular image of a "cyborg" may be mash-up the character from Teen Titans and the Six Million Dollar Man (the balance of each depending upon how old you are), but the reality is not nearly so exciting. The truth is, we've had people with cybernetic prosthetics for quite some time, and the number is growing quickly. They're not action heroes (by and large), they're people all too often casually dismissed as "disabled." But the demographics of the disabled are changing, as is the power of assistive technologies. And these changes have serious implications both for the role and visibility of the disabled in Western society and the ongoing debate between augmentation as "therapy" and augmentation as "enhancement." 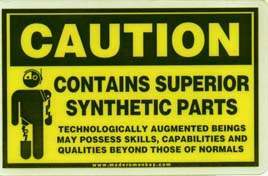 I speak from personal experience on this one; I recently joined the ranks of the cyborgs. 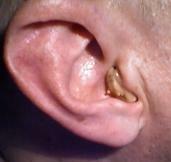 A few years ago, after noticing that my hearing seemed degraded, I saw an audiologist. His diagnosis wasn't encouraging: definite hearing loss, most likely congenital and almost certain to continue to degrade. At that point, it wasn't quite bad enough to require hearing aids. I went in for a new examination last month, and got the news: I really should be using hearing aids, at least if I wanted to stop annoying loved ones, friends and colleagues with my incessant "excuse me?" and "I'm sorry..." requests for repetition. 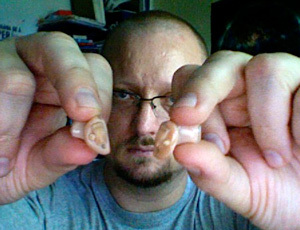 After a few fittings and follow-ups, I got my new hearing assistance devices this week, and I'm wearing them right now. These aren't just dumb amplifiers; they're little digital signal processors, small enough to fit into the ear canal, and smart enough to know when to boost the input and when to leave it alone. They're programmable, too (sadly, not by the end-user -- programming requires an acoustic enclosure, not just a computer connection). And here's where therapeutic augmentation starts to fuzz into enhancement: one of the program modes I'm considering would give me far better than normal hearing, allowing me to pick up distant conversations like I was standing right there. They're not without their drawbacks. They're somewhat uncomfortable -- not painful, but impossible to ignore. The quality of the sound I get through the devices will take some getting used to; the size of the speaker limits just how clear the sound can be, I'm told. And, as far as I can tell, the electronics in these things change very slowly, Moore's Law be damned. I think there's a generational issue here: up until recently, most people wearing hearing aids came from the pre-computer era, and expected to pay outrageous prices for technologies of a just-good-enough quality (especially medical technologies). As more Baby Boomers -- and those of us younger than the Boomers -- start to require augmentation technologies, the manufacturers will increasingly see demand for greater quality and faster improvement. A few hearing aid companies are beginning to see the light. Oticon, for example, offers a model of hearing aid with built-in bluetooth to make mobile phone calls easier. They don't come cheap, though -- just about $3,000 per ear. The first hearing aid company to act like a computer industry player instead of a medical tech industry player will make millions from the aging-but-tech-savvy. [MIT researcher Hugh] Herr, who has made it his life's work to design improved prosthetic legs, is being funded by the US Department of Veterans Affairs to work on a prosthetic ankle that returns more energy in each stride. Inside each prosthetic are battery-powered motors that do a similar job to muscles. Last week, he wore two of these brand-new ankles for the first time. "It was absolutely amazing," he says. "It's like hitting the moving walkway at the airport." People wearing the new prosthetic have been shown to expend 20 per cent less energy when walking than with a standard prosthetic, and Herr says their gait also looks completely natural. Herr mentions a 17-year-old girl who has decided to go ahead with an operation to amputate a damaged leg because, he says, she thinks a new prosthetic will give her more athletic ability than she has now. For his own part, Herr claims he would not swap his prosthetic legs for natural legs, even if he could. "Would you buy a computer system if you were told you couldn't upgrade it for 50 years?" he says. Herr's comment is eerily similar to an observation I made about why implanted computer systems were unlikely. We've seen such remarkable change in computer technology is such a short time, it's hard to imagine wanting to remain stuck with a rapidly-obsolescing model. But in a world of augmentation, is the biological body just another dead-end technology? Or, to make this more personal: I expect that, over the next decade, hearing aid technologies will have improved enough that most of the drawbacks will have been rectified, and I'll have access to hearing capabilities better than ever before; over that same time, we may see biomedical advances that can fix deficient hearing, restoring perfectly functional natural hearing. Augmentation for therapy slides inexorably into augmentation for enhancement. Should I give up my better-than-human hearing to go back to a "natural" state? This changing perception of both disability and augmentation can be summed up in this amazing picture of Sarah Reinertsen, taken by Stephanie Diani for a Times article about prosthetic fashion (and I strongly encourage you to click through to the full-size picture). Her artificial leg has no pretense of biology, yet is clearly part of her. It's not simply a prop to help her live a just-good-enough life; it's an augmentation that will only get better as the months and years pass. I doubt she looks with envy at the women with two "normal" legs on the dance floor; I suspect we're not too far away from a time when those women will look with envy at her. Woah. If this is confirmed, it's big. New analysis of Mars Rover images taken a couple of years ago in the "Endurance" crater seem to show standing pools of water on the Martian surface. Along with fellow Lockheed engineer Daniel Lyddy, [physicist Ron] Levin used images from the Jet Propulsion Laboratory's website. The resulting stereoscopic reconstructions, made from paired images from the Opportunity rover's twin cameras, show bluish features that look perfectly flat. The surfaces are so smooth that the computer could not find any surface details within those areas to match up between the two images. 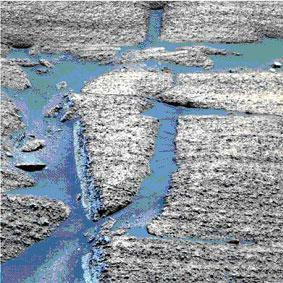 The imaging shows that the areas occupy the lowest parts of the terrain. They also appear transparent: some features, which Levin says may be submerged rocks or pebbles, can be seen below the plane of the smooth surface. This would greatly boost the likelihood of finding near-surface Martian life; in fact, the father of one of the authors, Gilbert Levin, laid out the evidence for Martian life (PDF) in a paper delivered at the Carnegie Institution Geophysical Laboratory last month, relying in part on the water discovery. Gilbert Levin was principal investigator on the Viking lander experiment that appeared to show signs of life. The main argument against this idea is that the density of the Martian atmosphere is so close to vacuum that water coming to the surface should just sublime away instantly. But some areologists have proposed that water may be able to exist for longer periods on the surface if certain conditions are met -- conditions that are most likely to occur in deep craters like Endurance. Update: It looks like Ron Levin didn't do his homework on this. Follow the link Peter Erwin provides in the comments. Short version: the image that Levin processed for his research turns out, when examined in context, to be part of a tilted cliff face, not a horizontal surface -- not a good spot for still water. JAMAIS: Have you run into any intellectual property disputes — recording something that someone else claims as their own copyrighted material? JUSTIN: Not yet. I guess if we were issued a takedown notice from someone who’s music I listened to… but we haven’t gotten anything. RU: It seems like the one thing that you need to avoid is watching a lot of other media. JUSTIN: Well, I don’t go to movies. And I think I’ve watched TV like one time in the past 56 days, and the camera wasn’t pointed at the screen. But honestly, the quality from the justin.tv camera (recording other media) is such that you’re probably better off BitTorrenting it anyways. JUSTIN: I understand that it doesn’t matter from a legal perspective. But, for instance, I’ve been invited by ClearChannel radio stations to come in the station and listen to music. I think they view it more as a promotional tool. RU: But the music industry might start displaying their hunger for reward as this gets more distributed — just like they’re doing with internet radio. A lot of people who use your equipment are going to be listening to music all the time — or else they’re going to have to change their lifestyles. 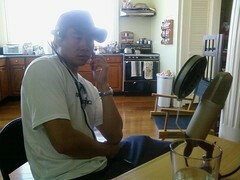 The photo above is a shot I took -- with a cameraphone, naturally -- of Justin during the recording of the show. The "Perspective" I recorded for KQED has now been scheduled to play this coming Thursday at 7:37AM (PDT) and again on Sunday at 7:37AM (PDT) on KQED radio (88.5 in the SF area, streaming radio elsewhere). An MP3 of the two minute bit will be available on the Perspectives web archive once it's been broadcast. My month of travel is over, and I look forward to sleeping in my own bed.  Vote Early, Vote Often: I recorded my KQED Perspectives piece earlier today, and once again was told that I have a voice for radio (they were polite enough not to mention that I have a face for radio, too). I've done a few podcasts, both here and for other sites, so let me throw this out as an open question: should I make a point of doing more? Would it be a good use of my time to add regular podcasts to the menu?  Sim Eh? : Canada: The New World (aka, HistoriCanada) is exactly the kind of simulation-history mashup I've wanted to see for awhile. Sponsored by Canada's National History Society and the Historica Society, HistoriCanada uses the Civilization III (with Conquest expansion) engine to play out the 16th-17th Century competition between the French, English, Ojibwe, Huron, Mohawk, Algonquin, Montagnais, Mi'kmaq, and Abenaki for the control of the Canadian territory. Produced by international media firm Bitcasters, the mod will be packaged with copies of Civilization III and donated to 100,000 Canadian high school students so that they may explore and learn about their country's past and even alter outcomes of historical events. Developed over a two year time, the game allows players to take control of one of Canada’s early European or Aboriginal civilizations, making important decisions ranging from planning their settlement and crops, to determining when to wage war or make peace. Civ III has a sufficiently detailed mod system that the game has the potential to offer insights into the drivers for conflict and diplomacy in the era. I haven't played it yet, so I don't know how successful the designers were, but it's exciting to see serious games & simulation systems used in this way.  Singularity Blogging: The Singularity Institute for Artificial Intelligence, like the Center for Responsible Nanotechnology and (more broadly) the Lifeboat Institute, is dedicated to examining the potential for civilization-threatening technological advances far enough ahead of time that we can make intelligent choices about how we implement such developments. Regardless of what one thinks about the likelihood of the "singularity" model coming true, the work done by SIAI will help to illuminate the possible pitfalls and traps we might encounter as we develop more and more powerful computers. This is precisely the kind of foresight work we need in greater abundance. I'm pleased to say that I've been informally working with SIAI, and greatly look forward to presenting at this year's Singularity Summit. I'm also pleased to note that SIAI has just launched a weblog, authored by the SIAI leaders, discussing both the technology and policy issues surrounding advanced artificial intelligence. This video gives a good overview of the ideas underlying SIAI's work, as well as some of the people involved in the project. Check it out.  Googlopticon: The Participatory Panopticon got name-checked in a BoingBoing post today about the Google Street View service. Street View isn't a real participatory panopticon, of course (and BoingBoing doesn't suggest that it is), and not just because it's being done by the massive, monolithic information overlord Google. One key element of the participatory panopticon concept is its documentary nature -- it's a way of building a record of what's happening around the, er, participants. The Google Street View images appear to be relatively static: what is shown now for a given address is likely to remain there for months, if not years to come. And that's something that Google may not have thought through. The layout of a city doesn't change very quickly, so a map is something where a decade-old version is almost certain to be still useful. 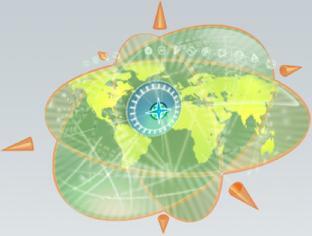 Business searches on the map can be easily updated by fiddling with a database. But what will happen when the image no longer matches the location? Or there's a fire? It's likely that the Street View images will be broadly seen as only marginally useful long before they get expanded beyond the current highly-limited set of locations. There's also the "gaming the Street View" question: what will be the first URL intentionally put up in order to show up on Street View?  Go Hug Your Planet: Today is World Environment Day. Actually, every day is world environment day, so perhaps this should be World Environment Day (Observed). The equation is simple, but the results are profound. Warmer oceans trigger larger and larger algae blooms along the North American west coast, and this year's bloom is massive. Such large algae blooms release domoic acid, which acts as a toxin, poisoning the fish and shellfish that feed on the algae. In turn, the birds and sea mammals that feed on the fish get poisoned by the concentrated acid. This year, sea life along the California coast appears to be dying in record numbers. Sea life including elephant seals, such as the two found dead on the beach at Pajaro Dunes, where I'm visiting with my wife's family this weekend. 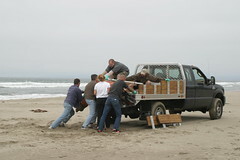 Researchers from the Long Marine Lab at UC Santa Cruz came out to retrieve the bodies today, and I ended up helping them (as seen in these photos at Flickr). They told me that, although the seals will need autopsies, domoic acid poisoning is the likely culprit. The algae population increases or "blooms" every year as the ocean waters warm but this year's bloom seems early, extensive and "very, very thick," said David Caron, who teaches in the biological sciences department at University of Southern California. "In five years of study I have not seen a bloom this large at this particular time of year," Caron said. Human activity, particularly nitrogen from fertilizer waste and global warming, contribute to the size of the algae blooms. This will, in time, come back to haunt us. Many scientists agree that increases in algal blooms in California and around the world are caused by a combination of factors, including agricultural run-off, oceanographic properties, and global warming. [...] Scientists first saw domoic acid poisoning in 1998, when over 70 sea lions died in one weekend. "We thought at the time that it was linked to the fact that it was an El Nino year, but we've seen it every year since then," says Frances Gulland of The Marine Mammal Center in Sausalito, California. "It's a big mystery." In the last five years, over 1000 animals have died from domoic acid poisoning, and there has been an increase in the number and extent of harmful algal blooms that produce the compound. "Sea lions eat the same foods we do, but more of them – foods like anchovies, squid, salmon, and mussels – we may see the effects of domoic acid in them before we see it people," says Gulland. 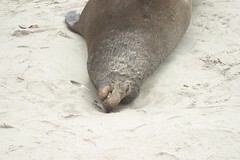 Researchers are already seeing signs of serious health problems, such as miscarriages and epilepsy, in sea lions. "Sea lions may be an early warning sign for humans," she says. It's not (yet) every day that one gets to pick up the body of a "canary in a coal mine."